BLACKSBURG, Va., Nov. 9, 2007 – Fuzhi Cheng has joined Virginia Tech's Institute for Society, Culture and Environment as a research fellow of the Global Issues Initiative, according to Karen A. Roberto, the institute's interim director. In this new position, Cheng will conduct research on international trade and economic integration. Prior to joining the institute, Cheng was a post-doctoral fellow at Cornell University (2005-2007) and a consultant in the Markets, Trade and Institutions Division at the International Food Policy Research Institute (IFPRI) in Washington D.C. (2004-2005). Cheng’s research focuses on food policies in developing countries and the development of a systems approach to address world food insecurity. He was a key researcher on a Cornell/IFPRI project that analyzed food, agricultural and nutrition policies in developing countries, collaborating with the Danish Agricultural University, Denmark, and Wageningen University, The Netherlands. 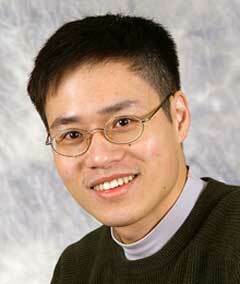 Cheng is coauthoring (with Per Pinstrup-Andersen at Cornell) an undergraduate textbook on the global food system. Their article “Still Hungry” that addresses solutions to global malnutrition appeared in Scientific American in September 2007. Cheng has also conducted research on exchange rate impacts on agriculture, agricultural subsidies, and technical barriers to trade. Cheng will be based in the Alexandria, Va., National Capital Region offices of Virginia Tech. He earned his Ph.D. in Economics from Virginia Tech in 2005.